Posting some of my stuff. Try not to laugh. I've only been doing this for about 8 weeks. From just being an email web surfer. I know, the Vinyl Stuff is out of proportion, etc. Perhaps this takes you back to your early days? lol... Please feel free to critique the hell out of it! Anticipate getting calls soon enough -- to curse you out for supporting the 45th President of the United States. You may want to rethink this "advertisement" since it absolutely alienates potential customers. Also, "Vinyl Stuff" is unreadable at 5 feet. 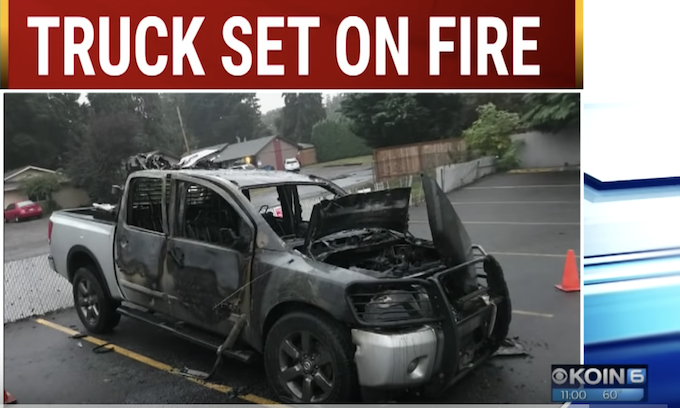 Oh, and by the way, this truck was burned to a crisp because it displayed TRUMP stickers. Perhaps Hilary reading a book with her dogs on the other side? Yeah, way small, Just using up the remnants of the vinyl that came with my cutter. Shirts and apparel is where the sweet spot is in my little side business. Signs are viable but also often demand installation which is where it gets more involved and risky. Hard to compete with the big shops who run flat bed printers. They pump out a 4'x8' for sale sign for $190 around here and do full color print decals for vehicles that are also hard to compete with. I actually did both for a long time but slid over to the apparel side as the demand built. I do maybe 5% signage and 95% apparel and the signage is for my shirt customers LOL. Best part for me, a part timer, is you can work in all weather and all times of the day or night. I hold down a day job and do the other at night or weekends. I got into team sports as well as shirts and have several clubs and schools that I build jerseys and parent gear for. a month if he goes for it. Two would be the bait. If you want I'll email what I have so far, for you to look at. You are welcome to change it anyway you see fit. I'm so busy that I don't even take on new work sorry. We did $7K worth of hoodies last week. It's that season. 15" press will get you started if you also grab a press pillow or two. I would suggest the swing away style, it gives you more ability to look down on the shirt and get things aligned. You will want to develop a system for squaring up the design on the shirt. Most shirts have a slight crease down the middle that is USUALLY centered, not always. I call this a build crease and I think they use it two sew when they actually make the shirts. If it's not visible just carefully fold it and press it for a couple seconds to form a center crease. Then you can use a clear plastic craft ruler if you have one or buy some sort of alignment guide purpose built. I have a couple of the Fiskars rulers with 1/4" lines along them. The basic layout is usually around 3 inches down from the neck collar and around 4 inches over to the center on a left chest logo. There are several alignment guides out there but all of them are only so-so accurate. There is no single one spot. It changes depending on the shirt style and size so you have to develop an eye for it. If the design is big enough to just align it by eye without the ruler I use a finger count to get them all similar, like two fingers down from the neck or three. A full hand down from the neck on back of a hoodie so there is room for the hood to hang without completely covering the logo. I usually lay one out on a table and just set the logo on and see what looks right and take a couple measurements before I press one. Nothing worse than having someones logo tucked under their armpit. Later when I got bigger and busy I bought a high end cutter and high end press (Fusion) and a $300 laser alignment system from Hotronix that has up to 4 red lasers that I set to keep everything square and all the same. This has been especially helpful with the sports jerseys that have a logo and a separate individual number and all need to look the same layout. You are welcome to send me a PM. You know how to do that? You're talking about print work there. Equipment to do that, and do it well is quite expensive, several thousand for the cheap stuff.